The Chinese giant Vivo has officially announced two new smartphones: the X27 and X27 Pro. Long awaited, these are devices with mid-range processors, but with a design and other specifications of premium level . The two models are similar, but present some differences at first sight. Both have a front-facing pop-up camera, but with different specs. Both have triple camera setup in the rear, but positioned differently. The base model X27 is the first in the X-Series to come with full-screen display. It features a 6.39-inch Super AMOLED screen with a 19.9:9 ratio and a large field of view and practically nonexistent bezels. Under the hood, the handset is powered by a hexa-core Qualcomm Snapdragon 710 SoC, paired with 8GB of RAM. The 128GB storage variant of the Vivo X27, however, has a Snapdragon 675 SoC. So we can see that the X27 has two different variants with different SoC. The front pop-up selfie camera is just like the recently launched Vivo V15 Pro but comes with additional features with halo ambient lighting for different moods with the help of tiny LED lights of six different colors. The front selfie pop-up camera and the triple rear camera setup are housed in the same module. The Vivo X27 has 128GB and 256GB of onboard storage options. Connectivity options include 4G LTE, Wi-Fi, Bluetooth, GPS/ A-GPS, and USB. The 256GB storage variant of the Vivo X27 also supports Vivo FlashCharge fast charging technology. The handset comes with Android Pie out of the box with the FunTouch OS 9 running on top. The Vivo user interface now has a dark mode that works with 300 different applications. The battery is generous with 4000mAh and has support for fast charging of 22W. Vivo, as expected, has a fingerprint sensor built into the display. There is no doubt that the Vivo X27 Pro is a model with steroids. Firstly, it has more than expected larger screen with Super AMOLED, comes with an impressive 6.7 inches and with 92.12% screen to body ratio. Its front camera, is a pop up system, has 32 megapixels and, like the base model, this comes with LED flash. Inside, we have a Snapdragon 710, with 8GB of RAM and 256GB of storage. 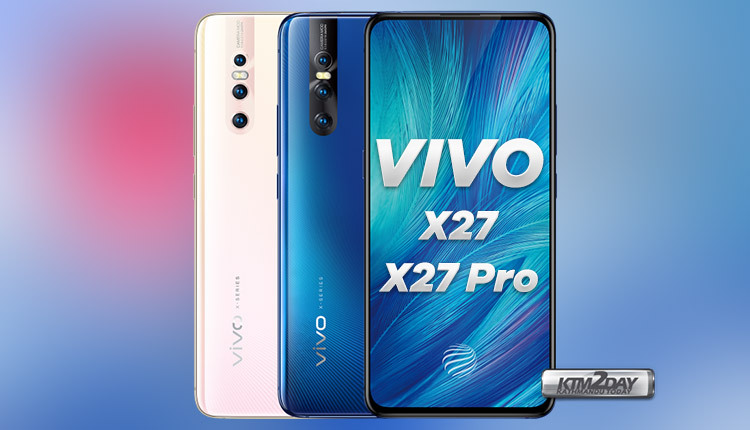 Similar to the X27, Vivo has provided a triple camera setup on the back of the X27 Pro that includes a 48-megapixel Sony IMX586 main sensor along with 13MP and 5 MP depth sensor lens. There is also a 32-megapixel sensor at the front.The camera compartment is housed in the center as in Oppo F11 Pro. The smartphone has a chip entirely dedicated to audio and features NFC. However, it still fails on the processor. The Vivo X27 Pro runs on FunTouch OS 9 based on Android 9 (Pie) out of the box. The Vivo X27 starts at 3198 Yuan (about $476) for the SD 675 version, which increases to 3598 Yuan(~$536) for the SD 710 variant. 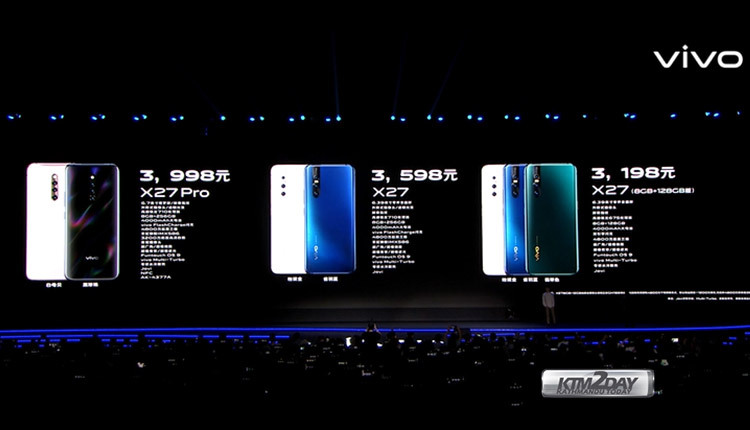 The Pro version is to be sold for 3998 Yuan(~$595), but won’t be available for sale until April 2019. The X27s, on the other hand, will be released for sale on March 23, 2019.